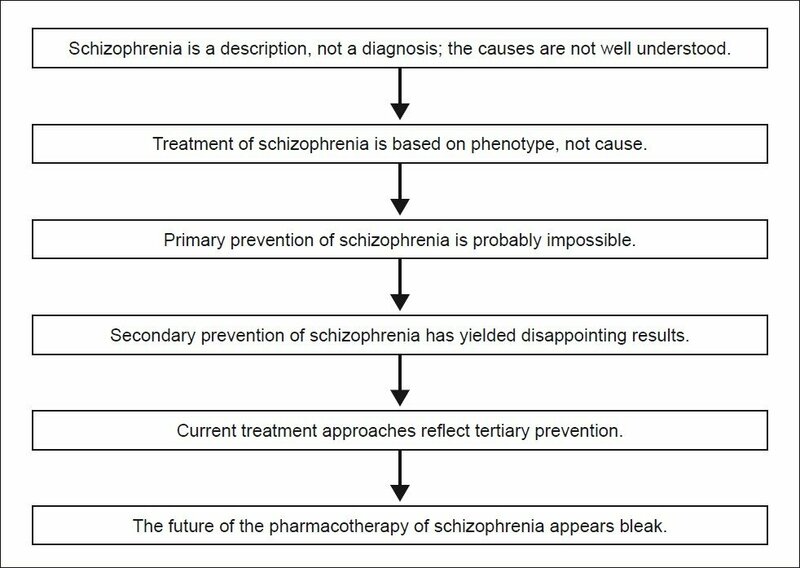 Introduction: More than half a century after the introduction of effective pharmacotherapy for the illness, in most patients schizophrenia remains a chronic, relapsing condition with poor long-term outcomes. Methods: We examine the pharmacological treatment of schizophrenia from different perspectives to understand why there have not been significant advances, and to consider what the future might hold in store. Results: We argue that the treatment of schizophrenia addresses the phenotype and not the cause; that the causes may not be treatable even if identifiable; that secondary prevention approaches involving treating the phenotype before full-fledged illness develops have, so far, not yielded promising results; and that shifting the focus of treatment from dopamine to other neurotransmitter systems is merely a tertiary prevention approach which will not reverse the extensive structural and functional pathology of schizophrenia. Conclusions: We believe that, given the current state of our knowledge of the illness, the future of the pharmacotherapy of schizophrenia looks bleak. Although medications have been available for schizophrenia for over half a century, the diagnosis remains a heavy cross to bear. What might the future have in store? In the rest of this article, we paint a pessimistic picture. The problem begins with the diagnosis itself. An important tenet of good medical practice is that efficient treatment is based on a knowledge of diagnosis and the underlying pathophysiology. Schizophrenia, however, is not a diagnosis; it is a description; that is, a phenotype. What schizophrenia is cannot be discerned from its phenomenology any more than what a person's gender is can be determined from the clothing. Furthermore, schizophrenia is almost certainly not a single disorder; it is a group of conditions (van Os et al., 2009  ). Additionally, it is a group of conditions with extensive pathophysiological features (Keshavan et al., 2008  ). Finally, it is a group of conditions with widely varying phenotypes, biological characteristics, and outcomes (Tandon et al., 2009  ). Current treatments of schizophrenia are based on the phenotype and treat the phenotype (Andrade, 2012  ). Consider fever or pain as a parallel. We can effectively treat fever with antipyretics or pain with analgesics; but, if the underlying condition is not self-limiting, our treatment will remain incomplete until we treat the cause of the fever or of the pain. Most forms of schizophrenia do not appear to be self-limiting (Rabinowitz et al., 2007  ). Therefore, we may treat the phenomenology of the illness with dopamine receptor antagonists, but unless we are able to effectively treat the cause of the illness, the diagnosis will remain with the patient. Treatment of the cause is also important because if causes are different, treatments can be different and even individualized. Can we treat the cause and the pathophysiological mechanisms that are intermediate between cause and phenotype? To do this, we must be able to identify both cause and mechanisms. So far, our knowledge of cause and pathophysiology, though extensive, is incomplete. The most popular model posits that, for schizophrenia to develop, there must be a predisposition and, afterwards, a trigger (Maynard et al., 2001  ). Other models are possible; the predisposition may be so strong that no trigger is necessary and the individual will inevitably develop the illness. Or, no predisposition may be present, but the exposure to stress is so severe that psychosis manifests. What are the predispositions? A wide range of genetic influences have been suggested, with important candidates including the DISC, dysbindin, neuregulin, and COMT genes (Stahl, 2008  ). Other predisposing influences include viral infection during the second trimester of pregnancy (Penner et al, 2007  ), perhaps with season of birth moderating this variable (Davies et al., 2003  ); maternal exposure to famine (St Clair et al., 2005  ); obstetric complications around childbirth (antenatally, intranatally, and/or postnatally) (Cannon et al., 2002  ); neurological insults such as head injury during early childhood (AbdelMalik et al., 2003  ), and others (Tandon et al., 2008  ). What are the triggers? Hormonal changes during adolescence (van Rijn et al., 2011  ) and toxins in air and diet (Do et al, 2009  ) have both been suggested, but stress is the most significant candidate (Corcoran et al., 2003  ). Muddying the picture, genetic influences may affect the risk of obstetric complications; both may separately affect the risk of cerebral insult during childhood; and all may separately affect the risk of poor coping and susceptibility to stress (Mittal et al., 2008  ). So, treating the phenotype of schizophrenia after the clinical phenotype appears is akin to starting treatment for hypertension after the patient has suffered a myocardial infarction or an intracranial bleed. Models of treatment in medicine are classified as primary, secondary, and tertiary prevention interventions. Primary prevention refers to the prevention of occurrence of the disorder. Secondary prevention describes early diagnosis and treatment. Tertiary prevention addresses prevention of complications and rehabilitation (Caplan, 1964  ). The primary prevention of schizophrenia is a pipe dream. With regard to genes, we cannot change the genes with which a person is born. At best, we can provide genetic counselling. However, this is a drop in the ocean because gt; 80% of patients with schizophrenia have no family history of illness (Tsuang, 2000  ). Can improved antenatal care, improved obstetric care, and improved neonatal and paediatric care reduce risks? In theory, yes; in practice, there are no data to indicate that countries with higher health care standards have a lower risk of schizophrenia (Saha et al., 2006  ). One possible reason is that perinatal complications contribute little to the variance in the risk of the illness (Verdoux, 2004  ). Can we screen for and identify vulnerable individuals at birth and institute corrective or compensatory interventions? At present, we do not even know for certain the extent to which various candidate genes contribute to the risk (Prasad et al., 2010  ). Furthermore, it is now widely believed that no single gene causes schizophrenia; rather, a group of genetic influences are probably responsible (Girard et al., 2011  ), and that's where our current understanding stops. With regard to perinatal complications, as already mentioned, such effects contribute little to the variance in the risk of the illness and so a very large number of persons with obstetric contributions will not develop schizophrenia in later life (Dalman et al., 1999  ). When we cannot identify persons at risk, there is no possibility of even considering corrective or compensatory measures in order that the effect of the casual factors do not progress. In theory, cellular or gene-based approaches should be considered at a primary prevention level, but have we made progress with simpler, monogenic disorders, such as Huntington's dementia, for which the genetic causes are known? If not, where is there scope to hope that we will succeed with schizophrenia? Where does psychopharmacology come in for the secondary prevention of schizophrenia? We cannot reliably identify persons who will go ahead to develop schizophrenia in later life. Even if we can identify such persons, there is nothing that we can do to treat the effects that genetic factors, obstetric complications, and other insults have on the developing brain. In the highest risk individuals, the use of antipsychotic drugs and behavioural interventions have yielded mixed results, are considered controversial and, at best, postpone the onset of the schizophrenia phenotype by a short period (McGorry, 2008  ; Pelosi, 2008  ; Marshall and Lockwood, 2004  ). With specific regard to prophylactic psychopharmacological intervention in high-risk individuals: The advantages theoretically include all the benefits associated with early recruitment into treatment in the true positives. These benefits could be better social outcomes, less risk of substance abuse and suicide, and other benefits that have been described with minimization of the duration of untreated psychosis (Marshall et al, 2005  ; Perkins et al, 2005  ; Melle et al., 2008  ). The disadvantages are all the disadvantages associated with institution of treatment in the false positives, including medication adverse effects, stigma, and load on the healthcare system. Tertiary prevention targets in psychopharmacology include positive symptoms, negative symptoms, mood symptoms, cognitive deficits, quality of life, and occupational functionality; the benefits are modest. Current psychopharmacological strategies primarily address the dopaminergic neurotransmitter system (Andrade, 2012  ). Fifty years of drug development towards dopamine postsynaptic receptor blockade with or without serotonergic modulation have merely resulted in variations on a theme of tolerability, with broad efficacy no different across the entire spectrum of drugs (clozapine excepted) (Kane and Correll, 2010  ). Efforts in drug development now address various targets in glutamatergic, cholinergic, adenosine, serotonergic, and other neurotransmitter systems. There is no reason to believe that these strategies will be any more successful than those so far in use. Tinkering with proteins outside the cell can do little to change fundamental abnormalities that lie within. In summary, as already discussed, there is no way in which psychopharmacology can be called into play for primary prevention, and there is controversy about the benefits of current psychopharmacology for secondary prevention. Where psychopharmacology presently focuses is on tertiary prevention, after the disease has taken root. In affected patients, there are extensive changes in multiple territories in the brain, ranging from the prefrontal cortex to the cerebellum; from the hippocampus to the corpus callosum (Arnsten, 2011  ; Andreasen and Pierson, 2008  ; Tamminga et al., 2010  ; Whitford et al., 2010  ). The changes are both gross, detectable on magnetic resonance imaging (Levitt et al., 2010  ), and microscopic, identified by histopathological studies post mortem (Schnieder and Dwork, 2011  ). These changes do not develop overnight; rather, they progress during childhood into adult life (Mattai et al., 2011  ). And, these changes are almost certainly irreversible; it is unlikely, for example, that abnormal cytoarchitecture of the cerebral cortex can be changed by drug therapy. So, by the time the clinical phenotype is imminent or actually appears and drugs are pressed into play, it is already too late. In most forms of schizophrenia, therefore, all that psychopharmacology can do is to reduce complications and reduce symptoms so that rehabilitatory measures can be implemented. As bleak as the future may seem, it is however, worth remembering that most of the significant discoveries in science have been unpredictable, serendipitous, and contradictory to scientific paradigms that were current (Kuhn, 1962  ). The past and present state of research may hence not necessarily reflect the future. Primary prevention in schizophrenia is probably impossible. Secondary prevention approaches have so far met with disappointing results. The focus of drug discovery in schizophrenia lies in the realms of tertiary prevention, when the phenotype manifests, by which time extensive and probably irreversible structural and functional brain changes have developed. The future of the pharmacotherapy of schizophrenia appears bleak. This is an original manuscript. The contents have not been published elsewhere in part or whole, nor have they been submitted elsewhere for consideration for publication. Will the causes of schizophrenia eventually be pinned down into discrete sets so that the illness can be partitioned into discrete disorders? Can drug development address intracellular targets that correct or compensate for intracellular disturbances without disturbing normal cellular functioning in the targeted cells and in cells elsewhere in the brain and body? 1. AbdelMalik P, Husted J, Chow EW, Bassett AS. Childhood head injury and expression of schizophrenia in multiply affected families. Arch Gen Psychiatry 2003;60:231-6. PMID: 12622655. 2. Andrade C. Psychopharmacology. In: Bhugra D, Ranjith G, Chaturvedi SK, editors. Handbook of Psychiatry: A South Asian Perspective. 2 nd ed. New Delhi: Byword Viva; 2012. 3. Andreasen NC, Pierson R. The role of the cerebellum in schizophrenia. Biol Psychiatry 2008;64:81-8. PMID: 18395701. 4. Arnsten AF. Prefrontal cortical network connections: Key site of vulnerability in stress and schizophrenia. Int J Dev Neurosci 2011;29:215-23. PMID: 21345366. 5. Cannon M, Jones PB, Murray RM. Obstetric complications and schizophrenia: Historical and meta-analytic review. Am J Psychiatry 2002;159:1080-92. PMID: 12091183. 6. Caplan G. Principles of preventive psychiatry. New York: Basic Books; 1964. 7. Corcoran C, Walker E, Huot R, Mittal V, Tessner K, Kestler L, et al. The stress cascade and schizophrenia: Etiology and onset. Schizophr Bull 2003;29:671-92. PMID: 14989406. 8. Dalman C, Allebeck P, Cullberg J, Grunewald C, Köster M. Obstetric complications and the risk of schizophrenia: A longitudinal study of a national birth cohort. Arch Gen Psychiatry 1999;56:234-40. PMID: 10078500. 9. Davies G, Welham J, Chant D, Torrey EF, McGrath J. A systematic review and meta-analysis of Northern Hemisphere season of birth studies in schizophrenia. Schizophr Bull 2003;29:587-93. PMID: 14609251. 10. Do KQ, Cabungcal JH, Frank A, Steullet P, Cuenod M. Redox dysregulation, neurodevelopment, and schizophrenia. Curr Opin Neurobiol 2009;19:220-30. PMID: 19481443. 11. Girard SL, Xiong L, Dion PA, Rouleau GA. Where are the missing pieces of the schizophrenia genetics puzzle? Curr Opin Genet Dev 2011;21:310-6. PMID: 21277191. 12. Kane JM, Correll CU. Past and present progress in the pharmacologic treatment of schizophrenia. J Clin Psychiatry 2010;71:1115-24. PMID: 20923620. 13. Keshavan MS, Tandon R, Boutros NN, Nasrallah HA. Schizophrenia, "just the facts": What we know in 2008 Part 3: neurobiology. Schizophr Res 2008;106:89-107. PMID: 18799287. 14. Kuhn TS. The Structure of Scientific Revolutions (p52-65). 1 st ed. Chicago: University of Chicago Press; 1962. 15. Levitt JJ, Bobrow L, Lucia D, Srinivasan P. A selective review of volumetric and morphometric imaging in schizophrenia. Curr Top Behav Neurosci 2010;4:243-81. PMID: 21312403. 16. Marshall M, Lewis S, Lockwood A, Drake R, Jones P, Croudace T. Association between duration of untreated psychosis and outcome in cohorts of first-episode patients: A systematic review. Arch Gen Psychiatry 2005;62:975-83. PMID: 16143729. 17. Marshall M, Lockwood A. Early Intervention for psychosis. Cochrane Database Syst Rev 2004;(2):CD004718. PMID: 15106257. 18. Mattai A, Hosanagar A, Weisinger B, Greenstein D, Stidd R, Clasen L, et al. Hippocampal volume development in healthy siblings of childhood-onset schizophrenia patients. Am J Psychiatry 2011;168:427-35. PMID: 21245087. 19. Maynard TM, Sikich L, Lieberman JA, LaMantia AS. Neural development, cell-cell signaling, and the "two-hit" hypothesis of schizophrenia. Schizophr Bull 2001;27:457-76. PMID: 11596847. 20. McGorry PD. Is early intervention in the major psychiatric disorders justified? Yes. BMJ 2008;337:a695. PMID: 18678593. 21. Melle I, Larsen TK, Haahr U, Friis S, Johannesen JO, Opjordsmoen S, et al. Prevention of negative symptom psychopathologies in first-episode schizophrenia: Two-year effects of reducing the duration of untreated psychosis. Arch Gen Psychiatry 2008;65:634-40. PMID: 18519821. 22. Mittal VA, Ellman LM, Cannon TD. Gene-environment interaction and covariation in schizophrenia: The role of obstetric complications. Schizophr Bull 2008;34:1083-94. PMID: 18635675. 23. Pelosi A. Is early intervention in the major psychiatric disorders justified? No. BMJ 2008;337:a710. PMID: 18678594. 24. Penner JD, Brown AS. Prenatal infectious and nutritional factors and risk of adult schizophrenia. Expert Rev Neurother 2007;7:797-805. PMID: 17610387. 25. Perkins DO, Gu H, Boteva K, Lieberman JA. Relationship between duration of untreated psychosis and outcome in first-episode schizophrenia: A critical review and meta-analysis. Am J Psychiatry 2005;162:1785-804. PMID: 16199825. 26. Prasad KM, Talkowski ME, Chowdari KV, McClain L, Yolken RH, Nimgaonkar VL. Candidate genes and their interactions with other genetic/environmental risk factors in the etiology of schizophrenia. Brain Res Bull 2010;83:86-92. PMID: 19729054. 27. Rabinowitz J, Levine SZ, Haim R, Häfner H. The course of schizophrenia: Progressive deterioration, amelioration or both? Schizophr Res 2007;91:254-8. PMID: 17293084. 28. Saha S, Welham J, Chant D, McGrath J. Incidence of schizophrenia does not vary with economic status of the country: Evidence from a systematic review. Soc Psychiatry Psychiatr Epidemiol 2006;41:338-40. PMID: 16520883. 29. Schnieder TP, Dwork AJ. Searching for neuropathology: Gliosis in schizophrenia. Biol Psychiatry 2011;69:134-9. PMID: 21035789. 30. St Clair D, Xu M, Wang P, Yu Y, Fang Y, Zhang F, et al. Rates of adult schizophrenia following prenatal exposure to the chinese famine of 1959-1961. JAMA 2005;294:557-62. PMID: 16077049. 31. Stahl SM. Stahl's Essential Psychopharmacology: Neuroscientific Basis and Practical Applications. 3 rd ed. Cambridge: Cambridge University Press; 2008. 32. Tamminga CA, Stan AD, Wagner AD. The hippocampal formation in schizophrenia. Am J Psychiatry 2010;167:1178-93. PMID: 20810471. 33. Tandon R, Keshavan MS, Nasrallah HA. Schizophrenia, "just the facts" what we know in 2008. 2. Epidemiology and etiology. Schizophr Res 2008;102:1-18. PMID: 18514488. 34. Tandon R, Nasrallah HA, Keshavan MS. Schizophrenia, "just the facts" 4. Clinical features and conceptualization. Schizophr Res 2009;110:1-23. PMID: 19328655. 35. Tsuang M. Schizophrenia: Genes and environment. Biol Psychiatry 2000;47:210-20. PMID: 10682218. 36. van Os J, Kapur S. Schizophrenia. Lancet 2009;374:635-45. PMID: 19700006. 37. van Rijn S, Aleman A, de Sonneville L, Sprong M, Ziermans T, Schothorst P, et al. Neuroendocrine markers of high risk for psychosis: Salivary testosterone in adolescent boys with prodromal symptoms. Psychol Med 2011;41:1815-22. PMID: 21251344. 38. Verdoux H. Perinatal risk factors for schizophrenia: How specific are they? Curr Psychiatry Rep 2004;6:162-7. PMID: 1542468. 39. Whitford TJ, Kubicki M, Schneiderman JS, O'Donnell LJ, King R, Alvarado JL, et al. Corpus callosum abnormalities and their association with psychotic symptoms in patients with schizophrenia. Biol Psychiatry 2010;68:70-7. PMID: 20494336. Chittaranjan Andrade , MD, is Professor, Department of Psychopharmacology at the National Institute of Mental Health and Neurosciences, Bangalore. He has received 3 international awards, 10 national awards and 6 state and other awards in recognition of his research. He has published 12 books, nearly 40 chapters in various texts, and around 400 scientific papers in peer-reviewed journals. His main research interests lie in the field of electroconvulsive therapy, but is also involved in research and development of herbal psychotropic medicinal substances. He is also an experienced research methodologist with considerable expertise in statistical analysis. He is a committed educator, publishing a thrice-weekly electronic newsletter, the Synergy Times, which, since 2001, has been reaching psychiatrists across the world. He is a member of the editorial boards of The Journal of ECT, Brain Stimulation, Indian Journal of Psychiatry and the Mens Sana Monographs. He is also Field Editor for Clinical Therapeutics for the journal Bipolar Disorders. He is an active freelance journalist with a crossword column running for 6 years. He has published three books for children, and around 800 articles in various newspapers and magazines. He has played 4 musical instruments for several orchestras and musical groups in Bangalore. He composes music, has written anthems of 2 schools and one college, and has featured often in radio and television broadcasts. He has been a mountaineer and has scaled 6 peaks in the Himalayas. Rajiv Radhakrishnan , MD is currently a postdoctoral fellow at Yale University School of Medicine, USA. Rajiv completed his postgraduate training in psychiatry from St Johns Medical College, Bangalore and moved to the US to pursue his interest in research. His primary research interest is in cognition, with a special focus on neurotransmitter modulation of top-down information processing in the context of schizophrenia. Rajiv has published in both Indian and international journals and has a number of awards to his credit. He is a member of the International Society for CNS Trials and Methodology (ISCTM) and has served on their workgroup. He also serves on the editorial board of the journal "Frontiers in Child and Neurodevelopmental Psychiatry". Praveen P. Fernandes M.D. is Associate Professor of Psychiatry at the Creighton University School of Medicine in Omaha, Nebraska, USA. He graduated medical school from St. John's Medical College in Bangalore, India and completed residency training in Psychiatry at the Postgraduate Institute of Medical Education and Research, Chandigarh, and the University of Texas Southwestern Medical School at Dallas, Texas. His clinical and research interests are in the areas of bipolar disorder, psychopharmacology and quality and systems improvement in psychiatry. He supervises and teaches postgraduate psychiatry residents and medical students at Creighton and is an attending psychiatrist at the Omaha Veterans Affairs Medical Center.